Perfect for Beginner,Kids and Pros with help of numbered tips,pattern chart and E.Book.Here is what you will get. 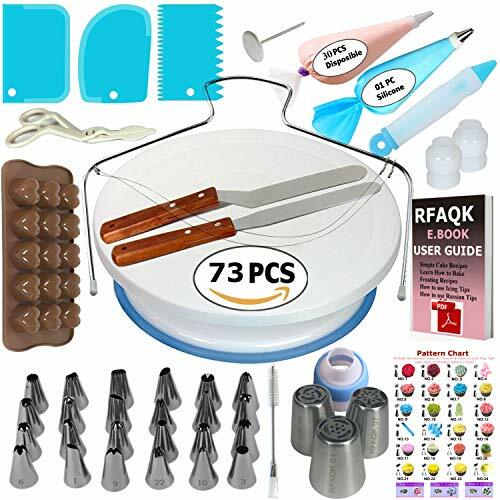 ✅ SMOOTH REVOLVING TURNTABLE: RFAQK turntable stand revolve smoothly with hidden ball bearings and helps you easily decorate cakes for birthdays, weddings and other events. It revolves clock & anti clock wise, good for both Right & Left handers. Use RFAQK straight spatula for icing round cakes from sides and angled spatula from Top while rotating turntable. Turntable is made from non sticky, non-toxic & dishwasher safe plastic. Ideal for beginners as well as for professionals. ✅ NUMBERED TIPS - EASY TO USE: This is the ONLY set having numbered tips with Pattern chart. So you don't have to worry about which tips produce what kind of decoration, just have a look on pattern chart where we have provided outcome of each tip to make tip selection very easy. ✅TOP PROFESSIONALLY SELECTED TIPS: We have selected top 24 tips including 2 Round Tips, 3 Leaf Tips, 2 Petal Tips, 2 French Tips, 2 Basket Weave tips,5 open Star Tips &4 close Star Tips, 2 Drop Flower tips. ✅USEFUL ACCESSORIES: Spice your decoration with 3 Flower Russian tips.Use chocolate mold to produce beautiful hearts.Use 3 scrapers to smooth icing on sides & top and carve designs. Use 2 couplers to exchange tips without exchanging piping bags. Use cleaning brush to clean narrow top of tips. RFAQK decorating pen helps you writing, decorating same as you doing with normal pen. Use flower nail with RFAQK petal tip to produce roses. Use flower lifter scissor to shift flower from nail to Cake. ✅RFAQK E.BOOK USER GUIDE FOR BEGINERS: E.book User guide by mail includes 3 cake recipes, Method of Cake Baking, Leveling & icing cakes. 3 frosting recipes, Step by step guide for using icing tips, Uses of different kind of tips (Round, Petal etc). ✅ 100% CUSTOMER SATISFACTION GUARANTEE: Your satisfaction is what drives us to provide the highest quality products. If at any time you are not completely satisfied with your purchase feel free to return it to us for a full and prompt refund. If you have any questions about this product by RFAQK, contact us by completing and submitting the form below. If you are looking for a specif part number, please include it with your message.